Owners Rob DiTursi (far right) and Jennifer Mitchell (far left), with CrossFit Rising Star members. CrossFit has seemingly taken gym-rat world by storm, and Rutland, Vt., is no longer an exception to the über-popular fitness program phenomenon. Owner Rob DiTursi has created Crossfit Rising Star, which opened Dec. 19 with free classes through the end of the year. Jan. 2 began paid classes and sessions in the Howe Center, Unit 11A, in Rutland. The program is trademarked as High Intensity Interval Training, or HIIT. DiTursi shares what CrossFit entails and how it benefits personal wellbeing . . . and that of Vietnam veterans, too. 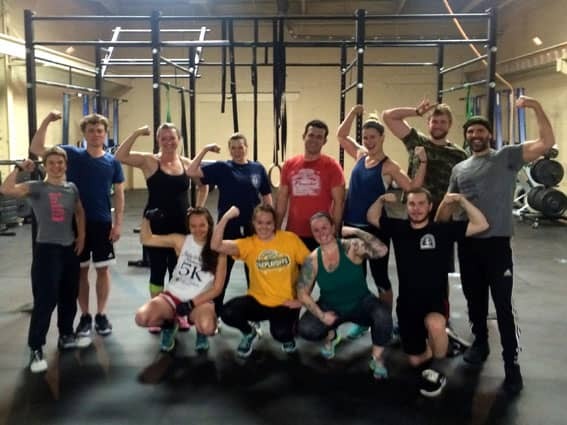 The Mountain Times: As the latest fitness studio addition to the Rutland area and the first to specialize in CrossFit, what can we expect that’s a bit unique about Crossfit Rising Star? Rob DiTursi: CrossFit is about complete fitness. In a CrossFit gym, you just don’t walk in and “work out,” every session is a structured class led by a CrossFit coach dedicated to helping you succeed. CrossFit is about increasing one’s overall strength endurance, agility and speed; it’s about treating everyone who walks through our doors not as a customer coming in for a workout but as an athlete coming to train and excel. CrossFit also aims for you to overcome your fears and do things you never thought you could do. Proper nutrition is the basis of CrossFit’s training model where we’ll also be offering guidance. CrossFit is about community, within our walls. You can expect to be challenged by our coaching and encouraged by your fellow athletes; every one of us here believes that the last person to finish is just as important as the first. One example of this was when a Marine veteran of Vietnam approached me and asked to buy a membership as a donation for any other Marine veteran interested. Other veterans have gotten word of the donation and it looks like more will soon follow. He has asked that other veterans who have the means, follow suit and do the same. We have already had interest in more membership donations from veterans in other branches of the armed services. MT: What is the Founder’s Club? RD: The Founder’s Club membership is a limited-availability, pay-up-front plan for those who are ready join the CrossFit Rising Star community and our concept of total fitness. At a cost of $1,099 for 13 months, this is the best bang for your buck. This price guarantees a lock on membership that will never be increased. Also included are discounts on future special classes, merchandise, and events. MT: There always seems to be a new workout program that takes over quickly and then fizzles—how does the CrossFit approach differ from the other short-lived fitness trends? RD: The first CrossFit was started in the year 2000, in a small garage in California. Today, 16 years later, there are over 10,000 CrossFit affiliates worldwide with a nationally televised CrossFit games competition to find the “Fittest on Earth.” The reason for its explosion in popularity is simple: CrossFit is not a trend but a lifestyle and, more importantly, CrossFit works. Through CrossFit training, the athlete begins to understand how the strength and tenacity they put forth in the gym carries over into their everyday life. You learn how to overcome challenges, celebrate the small achievements, and strive to take yourself to the next level. A CrossFit work out is constantly varied; it is not the same old routine each time you walk into the box. A CrossFit workout is intense; no matter what your fitness or skill level, you will be worked! MT: How are you engaging and motivation members outside the studio? RD: Outside “The Box,” Jen and I really just enjoy getting people moving. We really want to see everyone we know try out CrossFit, just once. We love training new people; there is always fear on their faces as they size up a new workout or skill, the “what have I gotten myself into” look. But at some point in the workout, that fear burns away and we see a new face, one of simple, exhausted, victory and pure achievement. That’s inspiring.